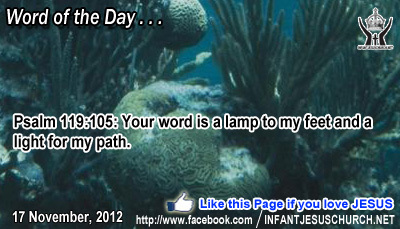 Psalm 119:105: Your word is a lamp to my feet and a light for my path. Heavenly Father, thank you for giving us your truth in Scripture. To know that you love us enough to communicate in language so we can hear and read your message is truly awe exciting to us. Make our heart hunger for your truth revealed in your Word. We want to grow to be a righteous and gracious child in your family. With all our love we pray to you in the name of Infant Jesus. Amen. 1 And he told them a parable, to the effect that they ought always to pray and not lose heart. 2 He said, "In a certain city there was a judge who neither feared God nor regarded man; 3 and there was a widow in that city who kept coming to him and saying, `Vindicate me against my adversary.' 4 For a while he refused; but afterward he said to himself, `Though I neither fear God nor regard man, 5 yet because this widow bothers me, I will vindicate her, or she will wear me out by her continual coming.'" 6 And the Lord said, "Hear what the unrighteous judge says. 7 And will not God vindicate his elect, who cry to him day and night? Will he delay long over them? 8 I tell you, he will vindicate them speedily. Nevertheless, when the Son of man comes, will he find faith on earth?" The Last Judgment will disclose that God's justice triumphs over all the injustices committed by his creatures and that God's love is stronger than death. The just that put their trust in God can look forward with hope to that day when they will obtain their reward. Jesus ends today’s parable with a inquisitive question for us. Will each one of us have faith – the faith that perseveres to the end – when Jesus returns in glory to judge the living and the dead? Faith is a completely free reward that God makes to us. If we want to live, grow, and persist in faith until the end, then we must nurture our faith with the word of God and ask the Lord to increase it. When trials and setbacks dissatisfy you, where do you place your hope? Do we pray with hopeful faith and confidence in God's merciful care and providence for you? Loving Infant Jesus, make our faith strong that we may never hesitate your promises. When we face trials and difficulties, help us to believe in your unfailing love and to find joy and satisfaction in you alone.